The Hadron (Model R4320C), embedded module of the easy2read© product line, is a RAIN RFID multiregional compact reader for high performances applications. With programmable output power from 17dBm to 31.5dBm, the reader reaches top reading performances being able to detect RAIN tags from a distance of 9 m. (30 feet) depending on the antenna and the tag used. 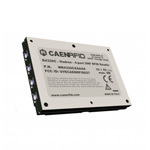 The radio frequency core of the module allows to achieve fast reading/writing operations and to work in dense reader and dense tag environments for top-class rated performances. 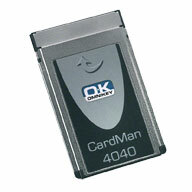 Due to its compact form factor, the module is specifically designed to be easily embedded in battery powered devices such as high performances handhelds and sleds. 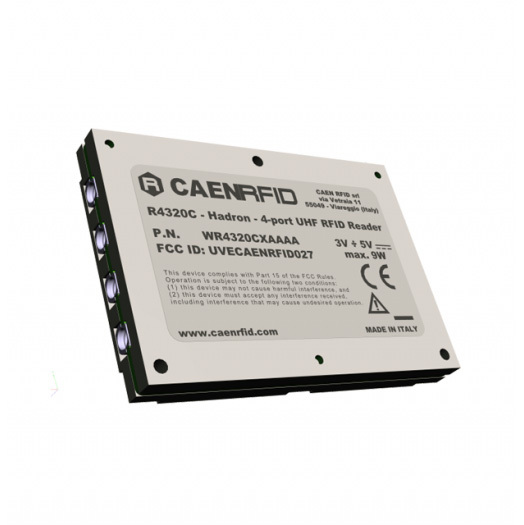 Thanks to the 4-antenna ports and the high power capability, the Hadron module is the perfect RAIN RFID core component to design full size readers for portals, industrial automation readers or any RFID device requiring long reading distances. READER ONLY! 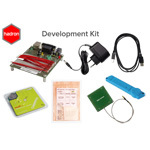 To add the development kit, please click here.